Renault ZE | What Car? 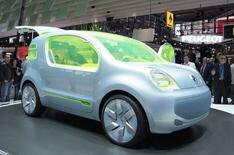 Renault threw its hat into the electric car ring in Paris, revealing the eye-catching ZE electric concept car. It's the forerunner to a production vehicle that will go on sale in 2011, and is based on the Renault Kangoo Be Bop, which is outlined in a separate story. The ZE is powered by a 98bhp electric motor with 167lb ft of pulling power. Charge is stored in lithium-ion batteries. In order to minimise power loss, the car features green-tinted glass, is covered in heat reflective paint and features insulation in the bodywork. Renault says this will minimise the need to run power-sapping climate control, although if it's required it will be powered by roof-mounted solar panels. Likewise, the bodywork is made up of two layers, with air trapped between them. As in a thermos flask, this layer minimises any changes in temperature. To improve aerodynamic efficiency, the car has cameras instead of wing mirrors, which are also powered by the solar panels and which transmit images inside the car. Inside the boot sits an electric scooter, which occupants can wheel out if they want to negotiate city traffic. Oh, and if you hadn't worked it out, ZE stands for zero emissions, although Renault has also tried to cut environmental hazards by keeping the number of liquids that would need disposing of at the end of the car's life to a minimum.